We highly recommend adding the optional Eternabond seam tape to your order! 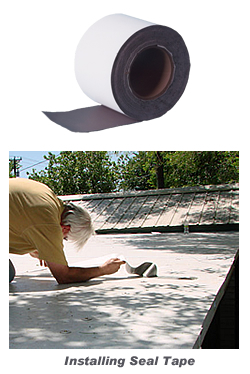 This tape greatly reduces the chance of leaks at your insulated roof's seams. Though the caulking provided with your kit works well to seal the roof panel seams, we have found that seam tape reduces the chance for leaks and the need to re-caulk yearly. We are offering this tape to you at our cost. The price is for 100' of tape if your project requires more than 100' it is on us. On the house so to speak. Choose the seam tape option in the drop down list to add to your order or be sure to tell our DIY Kit specialists you want to add it if ordering by phone.